Pain Physicians NY (Brooklyn, Queens, Manhattan, Bronx NYC) is one of the first sports injury clinics in New York to offer Platelet Rich Plasma (PRP) Injections for patients suffering with Knee Pain. 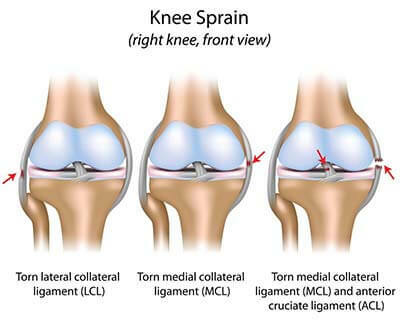 We provide effective Lateral Collateral Ligament injury treatment. Our facility equipped with the most advanced, cutting edge equipment to treat knee pain. This is an injury to the lateral collateral ligament, a thin ligament that runs along the outside of the knee. It connects the femur, the thighbone, with the fibula which runs down the shin to the ankle. Its purpose is to provide stability to the knee on the outer aspect. Ligaments are thick bands of tissue that are very strong to fulfill their purpose of providing stability, but even they can be susceptible to injury. Because of the location of this particular ligament, the injury is most commonly the result of direct force trauma, especially on the inside of the knee. When the inside of the knee is hit, the pressure is transferred to the opposite side where the LCL is, causing it to stretch abnormally. When the force is significant, the LCL may stretch to its limits and even tear. This kind of injury is most common in contact sports like rugby but also in those sports that require plenty of quick stops like basketball and football. Besides immediate damage to the LCL, the injury can also develop with time due to repeated stress in the knee that causes the ligaments to lose their normal elasticity. Physical tests are often sufficient to determine whether there is an injury to the LCL and how severe it is. The tests involve observation of the affected area to identify any inflammation and how serious it is. The doctor may also request that you flex your knee to determine the extent of the damage and the level of pain. If the cause of the pain is suspected to be serious, such as a torn ligament, there may be need for an MRI scan and X-ray to provide guidance. Most of the time, LCL injuries are not alarming or serious, even though there is certain knee pain. The condition is not serious though. Treatment option, therefore, may involve painkillers and anti-inflammatory medication to help make you comfortable. Rest and ice may also be recommended to give the ligament time to heal. Afterwards, physical exercise is advised to help resume activity. In serious cases, where the ligament is completely torn, ligament repair or reconstruction may be performed through surgery. This also often happens when the damage affects other parts of the knee. Preventing an LCL injury is often difficult, as these injuries result of an accident or unforeseen circumstances. Some preventive measures can help minimize the risk of an LCL injury. Make sure to stretch regularly before any physical activity or sports, strengthen your muscle legs and make sure to pay extra attention when playing sports like football or soccer.